Breathe Green Charcoal Bag Reviews - Is It a Scam or Legit? Ridding the air of odors, moisture and chemicals is as simple as setting out a Breathe Green Charcoal Bag, a fabric container housing activated bamboo charcoal. 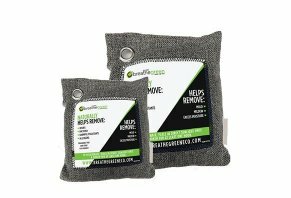 The Breathe Green Charcoal Bag is an odor and allergen remover that uses activated bamboo charcoal to quell awful smells, filter out particles that cause allergies and soak up moisture. What makes these bags unique among similar products is that they utilize heavy-duty fabric and “eco-friendly” materials to get the job one. We couldn’t find any information about the company who is selling these products. What we did find was that Breathe Green ships from a fulfillment center from which other products like supplements are shipped. In other words, the company who sells these deodorizing bags uses a third-party to ship them out – nothing out of the ordinary. In this review, we’re going to discuss how the Breathe Green Charcoal Bag works. We’ll also talk to you about how odor elimination work to test the Breathe Green’s claims. Then, we’ll talk about pricing and return policies, as well as how this product compares to others. Using this product is very simple. The website notes that these bags are great near “shoes, gym bags, luggage, suitcases, cars, bathrooms, freshly painted walls, fridges,” and more. They go on to point out that Febreze, the popular odor eliminator, has toxins in it while the charcoal in Breathe Green doesn’t. It’s important to point out that the charcoal in the bags not only eliminates odors but it also wicks moisture. As far as maintenance goes, you'll want to set your Breathe Green bags in the sun for an hour every month. There’s a section of the Breathe Green Charcoal Bag website that extols the virtues of the activated bamboo charcoal used in each bag. They say that because the charcoal is so porous, there are an impressive amount of air channels passing through it that can catch and trap allergens and odors. We went to WebMD to get a sense of what activated charcoal is. Basically, manufacturers of activated charcoal take regular charcoal and process it in a way that makes it more porous, or “activated”. Now, using activated charcoal as an ingestible medicine is up for debate. Many sites claim takin activated charcoal can clear your body of toxins when, in fact, WebMD says the only situation in which ingesting is is possibly helpful is within an hour of ingesting a poisonous substance. Activated charcoal as an air freshener, on the other hand, is pretty widely accepted as a way to clear the proverbial air, although it’s hard to say exactly how effective a product like Breathe Green will work in your home. We couldn’t find any explanations as to why you’d want to refresh your bag every month. However, we know that exposing items of clothing to sunlight can kill bacteria and such because the UV rays have been proven to kill some viruses, bacteria, and mold. Our assumption is that putting your Breathe Green bag in the sunshine for an hour allows the sun’s UV rays to kill off some of the microscopic stuff captured in the activated charcoal. We believe there’s some pretty clear evidence that activated charcoal functions well to remove odors and moisture. However, what we were not able to find is how much charcoal per cubic foot you’d need to remove moisture, odors or allergens. The product’s website says that you can buy bags for as little as $7.99. To buy it, you’ll have to go through a multi-step ordering process in which you have to provide your name, email address and phone number before you see pricing. Shipping on orders of three and five bags is $6.99 while shipping on 10 and 20 bags is free. Of note is that after about five minutes of having the pricing page open the site offered us a 10% off coupon. In other words, if you want to make a return, the product has to be unused, as putting it in a room to soak up odors and allergens could negate the “same condition that you received it” clause. We took a look at some of the top-rated activated charcoal bags on Amazon and found one clear advantage to buying there as opposed to buying bags through Breathe Green’s site: price. For example, Libertan’s activated bamboo charcoal bags are $14.99 for four bags. They get an average of 5 stars from the 15 reviews present at the time of writing. California Home Goods’ activated bamboo charcoal bags are arguably the king of the market on Amazon, with more than 1,500 reviews and an average rating of 4.3 stars. These bags cost $23.95 for four bags. The two products we mentioned above both seem to feature the same kind of sturdy material with which the Breathe Green bags are made. We believe that the greatest strength of this product is the fact that it’s pretty widely accepted as a way to fight odors and absorb moisture. The being said, the Breathe Green bags tend to be between $15 and $20 more expensive than comparable products on Amazon. Also, the return policies on Amazon tend to be more forgiving than the Breathe Green return policy, which seems to only allow you to return unused products. Write a Review for Breathe Green Charcoal Bag!